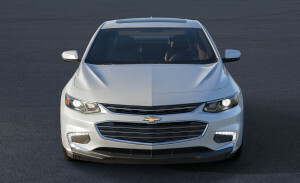 The 2016 Chevrolet Malibu weighs nearly 300 pounds less than the 2015 Malibu, mostly because of high-strength steels in the sedan’s 120-pound-lighter body. That will probably make things a little trickier for body shops who still aren’t up to speed on the material in general and General Motors repair procedures for the car which sold more than 188,500 units last year. However, at least there’s this comfort for technicians’ backs: If the repair requires you to remove an upgraded Malibu’s seats, they’re 30.5-40.6 pounds lighter than the 2015 Malibu’s, depending on if the owner splurged for the leather. “Imagine you’ve got a 300-pound lineman riding on the roof of your car and he decides to jump off – you’re going to notice a change in performance immediately,” GM chief engineer Jesse Ortega said in a statement Wednesday. “That’s what we’ve done with the 2016 Malibu, with the mass savings spread throughout the vehicle, providing greater overall balance, a more responsive and agile driving experience and lower fuel consumption. A GM spokesman said he was determining whether he could share where the high-strength steels were located in the Malibu body and how strong they were in terms of megapascals compared to 270 MPa mild automotive steel. GM said in its news release it conducted computer simulations to determine which locations,”such as the pillars and rockers,” would be best for the stronger steels. We’d guess that this indicates the Malibu’s high-strength steels will be configured similar to what we saw on the 2016 Chrysler 200 and 2016 Nissan Maxima sedans at Great Designs in Steel, with the strongest stuff showing up in the A- and B-pillars, roof bows and rocker panel. Aluminum made a showing too, replacing the steel hood for a weight loss of 6.6 pounds, and showing up in the chassis and suspension. GM also praised the responsiveness that both stiffer materials brought to the package for drivers. A July 2014 GM Repair Insights offered some perspective on repairing high-strength steels, indicating what you should and shouldn’t do in terms of sectioning and welding it. It warned that body shops should only section where GM says you can. “Failure to do so may compromise the structural integrity of the vehicle and cause personal injury if the vehicle is in a collision,” the Repair Insights piece states. Spot-weld only at factory locations with MIG brazing or plug-welding, and do not apply heat. Never use ultra-high-strength steel as a backing reinforcement or sectioning joint sleeve. This concept of looking outside the body and losing any excess weight, kind of like taking your keys out of your pants pocket before weighing yourself — has been floated by lightweighting experts. 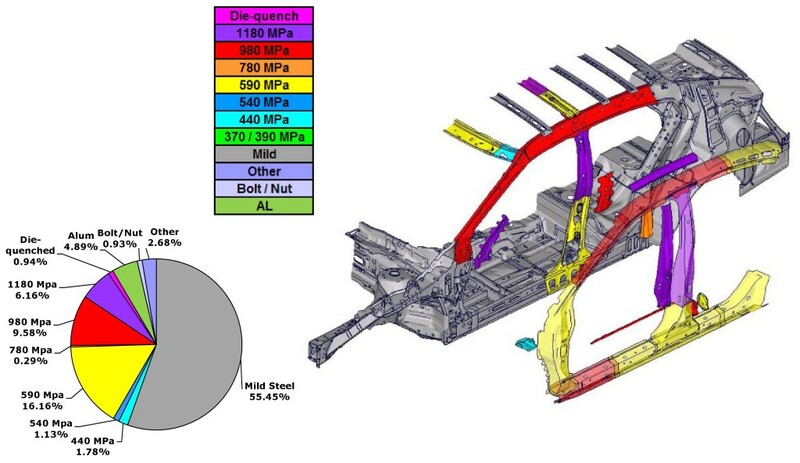 It’ll be interesting to see what kinds of nonstructural elements other automakers find can stand to lose a few pounds. 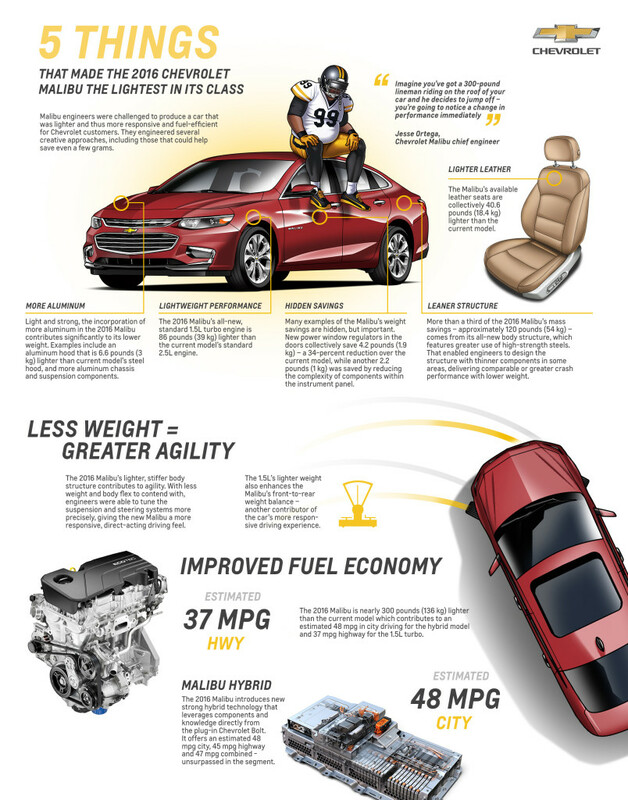 The car overall gets 37 mpg on the highway, according to GM, using what we’ll note for you mechanical folks is a 86-pound-lighter 1.5-liter turbo engine. A hybrid version will get 45 mpg on the highway, GM estimates. The car will first be sold sometime between October and December.